Or so ran the headline in The Independent newspaper today. If you live in the US or the UK, it’s likely you have come across hydraulic fracturing or ‘fracking’ in the media. This relatively new approach at extracting fossil fuels has generated plenty of controversy, both for it’s potential to restore fuel security and drive down prices and rising concerns regarding environmental impact. Now professor Averil MacDonald, chair of science engagement at the University of Reading has given a statement to The Times saying that women disagree with fracking because they “don’t understand” the science and instead rely on their gut reaction. Ah, where to begin… I have three main complaints about this statement; that it contravenes a responsibility in scientific engagement, that it harms dialogue and finally that it focuses on the wrong point. I will deal with these in turn. Firstly, the idea of a professor of science engagement accusing women of effectively making the ‘wrong choice’ because they are uneducated is both short-sighted and potentially derelict of a scientific duty to put evidence first. Professor MacDonald’s opinions are clearly partisan – she has recently been appointed chair of UK Onshore Oil and Gas, an industry group – and she makes no pretence otherwise. That is not a bad thing; scientists, like other citizens, can take sides on public issues, it’s part of what makes a democracy vibrant. However, her responsibility as chair of scientific engagement is to provide a balanced account that puts evidence first, as is the role of all scientific engagement with the public. Whether she states these opinions in her capacity, as UKOOG chair is irrelevant – her academic responsibility extends to all public engagement activities, a point sorely missing in discussions of the recent Tim Hunt affair. For someone who emphasises the role of ‘facts’ in determining the role of fracking in the UK, it is rather curious that any evidence on scientific education or decision making in women is conspicuously absent form her argument. At a fundamental level, what could possibly be accomplished by making these public statements? If you are a woman who disagrees with fracking, you will likely feel patronised and potentially less likely to listen to arguments from the pro-fracking camp, given that instead of communicating evidence they are now resorting to unnecessarily gendered attacks. If you are a woman who agrees with fracking, you will also likely also feel patronised, because the argument made is that you have somehow subverted your automatic emotional response (you are, after all, “naturally protective of your children” unlike men, according to MacDonald) and have risen to accept facts. And if you are a man, you are perhaps, like me, wondering what all of this has to do with fracking in the first place. The issue of fracking is a complex, multi-faceted issue that draws in considerations of economic development, energy security, fuel efficiency, environmental impact and disruption of rural communities, among others. It is certainly not an issue that can be reduced to “women don’t know better because they are poorly educated”. First, suggesting that someone cannot make an informed decision because of a lack of formal education is belittling and elitist, and dismisses the important democratic contribution of opinions from all sectors of society. Second, while women are under-represented in science and engineering, things are changing fast – many young women today will have an excellent scientific education and will be able to digest the complex evidence for and against fracking. In short, these kind of reductionist attacks will do more to alienate the kind of people that both sides need to appeal to, people who do want to be convinced by evidence, but who feel pushed away by sweeping generalisations and unfair portrayal in the media. This may strike our readers as obvious, but talking about why one group or another is for or against an issue, is not addressing the issue. If we are to have a constructive dialogue between those wishing to improve the financial and energy development of the this country, and those wishing to minimise the environmental impact and risks to human health, we need a common ground, and that common ground is provided by evidence. Focusing on evidence allows both sides to present their cases in a rational framework and most importantly, allows for compromise to be reached over facts that are agreed to by both sides. And attacking the education of decision-making skills of your opponent most certainly does not fall under this category. The Times (paywall) published the original interview with Professor MacDonald, which has also been covered by The Independent, Telegraph, Guardian and others. If, like me, you are not versed in statistical physics, you might as surprised as I was. Boltzmann brains? are we talking about 19th century physicist Ludwig Boltzmann’s actual brain, or some crazy AI project? As it turns out, neither. Boltzmann brains are a logical argument that speak deeply to cosmology, stochastic systems and our intuitions about the universe – and very little about actual brains. The argument goes like this: you have a universe around you governed by the laws of thermodynamics. Specifically the second law stipulates that in a closed system, any physical process leads to an increase in entropy; in other words, disorder amongst the component atoms inside the system. The universe is a closed system (i.e. it is finite) and therefore it tends to increase in entropy. Therefore, the ideal state for our universe is of thermodynamic equilibrium, in other words, high entropy. However, the world that surrounds us is not like that, we observe order everywhere, from stars and galaxies to the presence of life, which indicates low entropy in the system. So we are left with a sticky situation: thermodynamics predicts high entropy, and we observe low entropy. One solution would be to theorise the universe as mostly being in a state of high entropy, which occasionally fluctuates into a low entropy state and gives rise to our reality, before being quickly ushered back into chaos. This is when Boltzmann comes in – while he sees the universe as fundamentally statistical system, fluctuating between states of varying entropy, the idea of our perceptible reality being a statistical fluke appeared to him as nonsense. The problem is, every increasing step of complexity requires a increasingly rare statistical fluke of low entropy to give rise to it. So a bit of dust clumping together is more likely than a planet forming. Similarly, a star or a galaxy are increasingly more improbably scenarios in our thermodynamic balanced universe. Taking this argument to the extreme, if you wish to create a scenario where a series of unlikely stochastic processes from a maximally entropic starting point lead to a sentient being, it would vastly more probable that a) such sentience would be made up from the minimum number of components necessary, for example a lonesome brain without a body and b) that such sentience would exist for the smallest amount of time possible. It therefore follows that in this universe any sentient being is far more likely to be a single, floating brain immersed in the a chaotic universe flickering in and out of existence by sheer randomness, rather than the complex pastiche of order we see in our low entropy universe. Boltzmann brains are therefore, a reductio ad absurdum of the argument for our observable universe being a statistical fluke from thermal equilibrium. More fundamentally however, it’s also a paradox – the second law of thermodynamics holds in virtually every conceivable scenario covered by classical physics and yet our universe is ordered and low-entropic. In essence, Boltzmann brain can’t exist – it is in fact a tool in cosmological theory for arguing a theory is flawed, if it predicts their presence. And as I promised, they have little to do with actual brains. But they do speak of some fundamental concepts about the way we think about the physical universe. Firstly, and probably most appealing to Ludwig Boltzmann, that entropy is fundamentally statistical and our universe follows its rules. Secondly, that our current understanding of the universe is not reconcilable with fundamental thermodynamics, at least not without considering some more exotic theories about how the universe works, which is what physics is all about. And finally, it allows us to consider how unlikely sentience is, in the ‘high-entropy stochastic process’ sense; it is perhaps the most unlikely of all the observable things we see in the universe. So cheers to you, you vanishingly unlikely statistical fluke atop a high-entropy universe. An awful lot has been written about Boltzmann’s brain including a great series of articles for Discover Magazine, and in the New York Times. There’s even a video, if that’s more your thing. Sadly, I could not find any literature on Boltzmann’s actual brain. I recently joined the chattering forces of Twitter. Not a decision taken lightly, as I am well aware of the obsessive-compulsive nature of social media. But I was attracted by the excellent community of practicing scientists sharing thoughts, research ideas and just being a bit silly. Having watched from the sidelines for a few months now, and noticed something quite interesting. There was a fruitful and lively dialogue between established scientists – you know, busy people – and interested non-specialists. This kind of interaction was unheard of scarcely a few decades ago. It may sound like a small thing, and in part it is, but it’s also a sign of how the face of science communication is changing. Social media use is pervasive, democratic and increasingly prevalent in developing countries with little or no science journalism in the press. And while a pessimist may have prospected that science communication would have suffered with the advent of the likes of Twitter and Facebook, that we no longer know what is a trustworthy source and what is not, we’ve seen the rise of direct communication. Scientists, junior and senior, talking to people. Listening to people. This is a fundamentally valuable shift in the avenues for information, and, I may humbly argue, improves our focus and resolve for making science relevant to the lives of people around us. This is a great example of forcing scientists to think about the big picture while providing a colourful landscape of the research of today. And no small feat too, considering it condenses a 50,000 word behemoth into a pithy and succinct phrase – and still manages to amuse in the process. #ShareMyThesis is sponsored by the British Library and is full of amusing tales of research. Yours truly can now be followed on @scienceisnews for musings on neuroscience, journalism and science communication. You’ve probably heard it. There’s an ongoing Ebola virus epidemic in West Africa, which so far has claimed over 4,000 lives. While various news sites have been going into overdrive with the press coverage, both with extensive, pernicious coverage and speculation on the potential threat to the Western world, and the gargantuan task faced by healthcare workers in West Africa. Much discussion has been devoted to how dangerous Ebola virus really is. Both the WHO and CDC have made it abundantly clear that the Ebola virus does not pose a major health risk to developed nations with modern healthcare systems. But the threat to West Africa is very real, with the humanitarian NGO Medicine Sans Frontières declaring that unless an international effort is secured, the outbreak will worsen and expand for months to come. 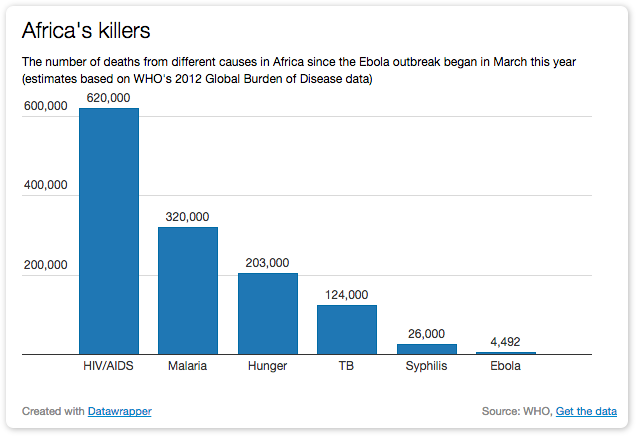 As you can see, it purportedly shows the burden of Ebola is much smaller when compared to other diseases. This message has an important consequence, that many of the ‘big killers’ are curable or can be managed, unlike Ebola virus which, at present, has no cure and only experimental therapies exist. It is an appealing notion to the utilitarians who may wish to maximise their relief effort through donations to combat the more manageable, and deadlier, diseases. 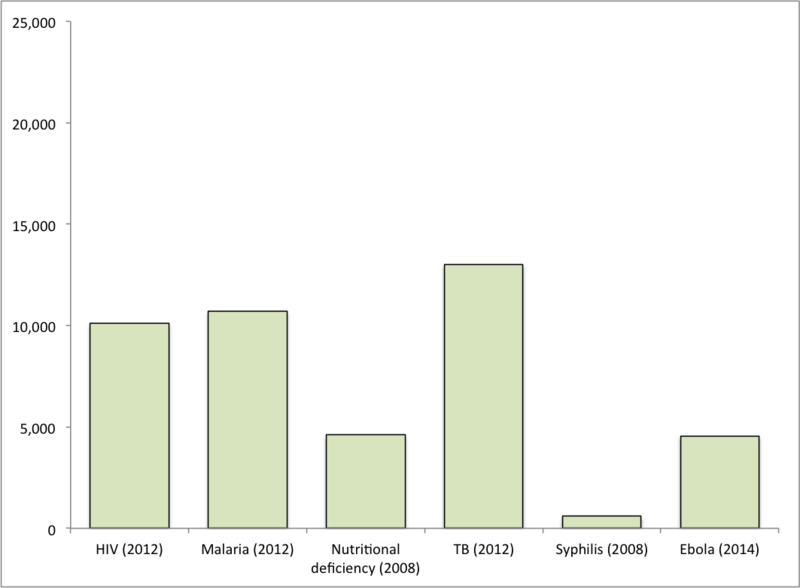 Malaria, TB and HIV are still significant problems, but Ebola is not the paltry, minor killer shown in the previous graph. Instead, it hovers at around half the number of deaths of those two diseases and equivalent to hunger. Now, ‘hunger’ is a difficult concept to categorise, and the WHO prefers deaths attributed to nutritional deficiency, so we have gone with that. 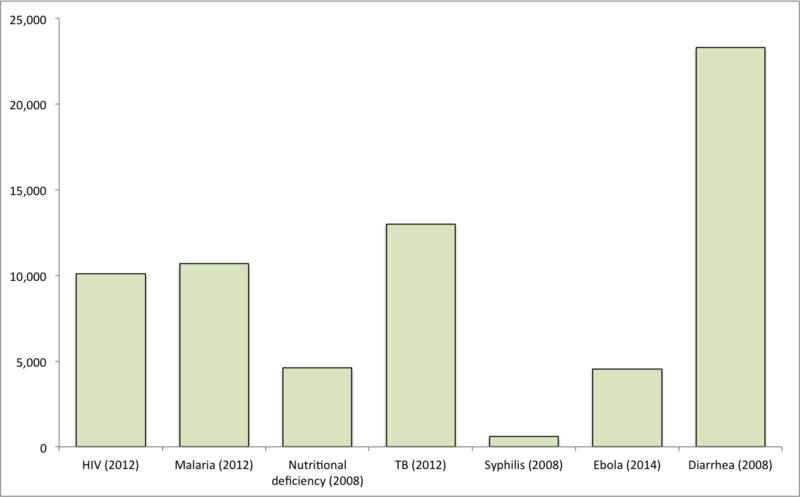 Also note numbers for nutritional deficiency are somewhat out-dated, from 2008, and big progress has been made against infant malnutrition since then, particularly in Sierra Leone. Diarrhoea, particularly in children under the age of 1, is by far the greatest killer in these three West African nations. So the original image is an excellent example of cherry-picking your data, by excluding perinatal complications such as diarrhoea and collapsing data across the whole African continent, instead of the relevant countries for this outbreak. It is difficult to compare the real, day-to-day impact of such diseases on the ground. Unlike malaria, TB or even HIV, the Ebola epidemic has had a devastating human, social and economic impact in West Africa. While other diseases may cause a greater number of deaths, and should be tackled as vigorously as Ebola, we must not obfuscate the point with bad graphics. The best kind of healthcare response is an informed one, and for that we need responsible, clear and objective data. Rates of Ebola virus infection and death in the current outbreak are being produced by the WHO and frequently updated on the relevant Wikipedia page. The WHO also keeps excellent public and readable statistics on health worldwide, including their 2012 report on the burden of disease showing country-by-country statistics. For those looking a more in-depth look at the nuts and bolts of Ebola, transmission and mechanisms of infection, I highly recommend this episode of the podcast This Week In Virology. Science and journalism have an uneasy relationship in the United States. For a country that has by far the largest scientific output in the world, it seems rather shy of discussing it in its popular media. Now, I do not wish to suggest the US lacks in science communication. Much to the contrary, it has produced some outstanding science communicators including Carl Sagan, Steven Pinker and Michio Kaku and some great citizen science initiatives such as Science At Home and Zooniverse. Instead, it seems to be something more specific to the mass market of mainstream media. 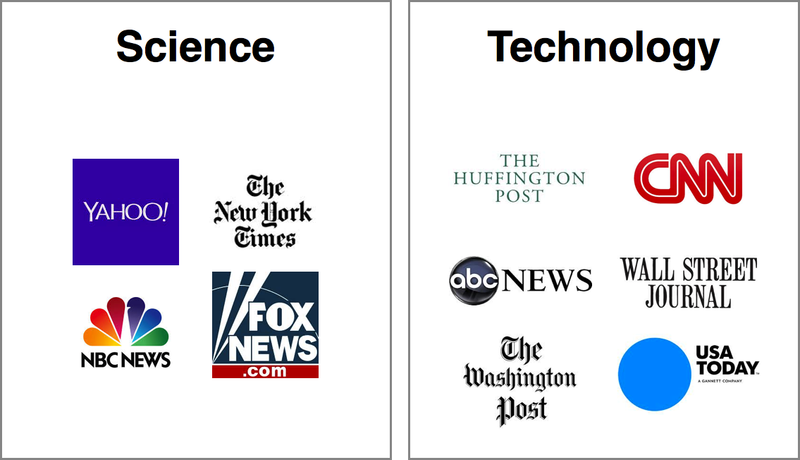 Six out of ten top websites choose to have a ‘tech’ section rather than science, and while the content is often similar, it is interesting to note how the same story can be labelled as either science or technology. Indeed, the word ‘science’ has attracted a certain negative connotation in US popular media – for example, the UK animated film The Pirates! In an Adventure with Scientists! was subsequently released in the US as The Pirates! Band of Misfits. We may speculate that the original title was deemed unmarketable for the US consumer, but it highlights the general point that science, or at least things that appear superficially related to science, are not seen as suitable for the mass market. That is not to say that there are no science programs in the mainstream – the popularity of Cosmos: A Spacetime Odyssey, a science documentary narrated by Neil deGrasse Tyson is a testament to the contrary. But an interesting example is the hit Discovery Channel show Mythbusters, where popular myths are subjected to rigorous tests to determine their validity. The model of Mythbusters is a fantastic example of the scientific method – confirmation through experimentation – but at no point in the show it is labelled ‘science’. There is clearly an appetite for popular science in the US, and with increasing levels of penetration in media and schools, we are likely to see a positive growth. Despite this, a reticence for the popularisation of science in mainstream media, at least in name, remains. If this trend is deep-rooted or simply an orthodox response to fears of a conservative backlash against the label of ‘science’ remains to be seen, but continuous improvements in education and engagement shows us we are likely to see a lot more science, under that name or another, in US popular media. Top 10 most popular non-aggregator news sites based on Alexa ratings on unique page views originating in the United States over the past 12 months. Is progress inevitable or are we doomed as a species by our own folly? It seems like a fairly fundamental question about our own condition, and it has certainly entertained many great minds and spawned thousands of works in literature and the arts – but the extinction or survival of civilisation enters the realm of science in the latest episode of The Infinite Monkey Cage on BBC Radio 4, a chat show mixing comedy and popular science. Host Brian Cox asks a very simple question: can science save us? And that is perhaps a tricky formulations, since we must first understand what we mean by science. Cox equates science to knowledge, a conception I would disagree vehemently with. While this may be accurate etymologically, the modern conception of science is the application of the scientific method to understand nature – with the resulting understanding forming part of a much wider umbrella term of knowledge. The key distinction is that science is a way of doing things rather than the end result, which is what permits us to falsify previously held ideas (i.e. knowledge) about how the world works. If we step back then, and assume we are speaking about knowledge derived from science, we can follow the line of the radio programme and ask: is knowledge always a good thing? It not in the nature of knowledge to be necessarily a positive thing – it is a truism to say ‘ignorance is bliss’, after all. For example, if you were very far away from your family and you learnt that one of your loved ones has passed away, you may feel distressed. But if such news never arrived, you will carry on your merry ways, despite the reality of the world is that that person is well and truly dead. But knowledge is completely dependent on interpretation – for example, if you learn that our Earth, this planet, is going to be consumed by the sun and disappear and in a few million years, you might lose sleep over that. But if you also learnt that those few million years are an astronomically large amount of time, and that humans will either be gone or long since evolved into some inconceivable creature, that we will have little to no emotional attachment to whatever species plods the Earth at that time, and the Earth itself would be unrecognisable to our eyes, then you will feel perhaps less upset about the whole affair. While knowledge may impact our thinking and acting, in the strict sense, neither science (a method) nor knowledge (ideas) are of any practical use to us, but rather their distillation into technological advances or behavioural and societal changes that positively impact our ability to survive and live comfortable lives on this planet. While it may seem pedantic, it is worth arguing that understanding this triad; science as the approach, knowledge as the vehicle and change as the product, is important to how we conceive the world, how we tackle the issues of today and, as Dr Lucie Green unremittingly points out, how we fund the science of tomorrow. Episode 4, Series 10 of The Infinite Monkey Cage aired on BBC Radio and is available as a podcast with extra material. The hosts were Brian Cox and Robert Ince and the guests were Stephen Fry, Prof Tony Ryan and Dr Lucie Green. The idea was quite bizarre to my close-minded scientific head, and about a dozen potential replies circled my head. “Most people wouldn’t understand it”, “academic papers are not written for mass consumption”, “we don’t need to, we have science journalism in mainstream media” and “there would just be too much stuff“. In the end, I settled for “it’s all digital now”, which is true for the vast majority of scientific publishing – papers are increasingly published, purchased and consumed in digital format, with the sight of the actual physical print a rarity in most academic departments. But this got me thinking. Why not? People have the right to buy scientific journals, particularly if they live in a country where research programmes are heavily funded by public entities – in fact, some people are arguing that they shouldn’t have to pay at all. But could we do this with old-fashioned print version of journals? Could we put them in a shop? Just how much space would it take? To find this out, we need to be a bit ingenious with numbers. According to the STM 2012 report on scholarly publishing, there were 1.8 million peer-reviewed papers published in 2012. Using growth rates estimated from a couple of sources, that number should hit around 2 million in 2014. If we presume our humble local magazine shop stocks these journals in the normal fashion, a new one every week, we are dealing with 38,462 articles a week. How much paper is that? A peer-reviewed article is typically between 3,000 and 10,000 words and following a completely unscientific survey of a few representative journals I had lying around (Nature, Science, PNAS) the going rate seems to be 800-1000 words per page, pictures and all. This works out at an average of 7.22 pages per article, as a very rough guess. Multiplying that by the number of weekly articles our shop would need to stock, we get 277,781 pages, and if we add covers, editorials and advertisement we can reasonably round it up to 300,000 weekly pages being churned out. Now the big question is whether our imaginary shop can actually hold that much content. With a typical magazine format of 120 pages in 12 x 28cm size, we are dealing with 2,500 unique weekly publications. Of course, we want to stock more than one copy of each, so 50,000 issues is not unreasonable. How much space would that take? At 8.50 m3 it would just about fit into a large transit van. Of course, if you actually want to be able to rifle through the contents, our shop would need a considerable floor space. If we display the journals face-on, as they typically are in book stores, it would need about 500 m of shelf space. Assuming absolutely no backlog and definitely not stocking the previous week’s edition, a very large, multi-storied shop could just about manage that. And it probably wouldn’t have room for National Geographic. For numbers of scholarly articles published, this article by Larsen & von Ins (2010), as well as reports by STM and the Royal Society were particularly helpful. Cue college students and worried mothers clicking away. A study by Northwestern University looked at long-term effects of cannabis in teenagers and compared the size and shape of subcortical structures of the brain in users vs. non-users. Interestingly, schizophrenic subjects who used cannabis had more exaggerated differences, suggesting a possible biological link between cannabis use and the condition. Correction: The title of this post was corrected to indicate that researchers have not concluded a direct link between heavy marijuana use and abnormal brain structure or poor memory, but to reflect that the study shows a possible association between the two. And this is exactly the issue we see with these kinds of reports, and what I would like to discuss. You could argue there is a fundamental incompatibility between piecemeal research and the journalistic demand for headlines. In order to make good news, a science story must be gripping – it must tell us something new that is interesting, or relevant to our lives. It must have a beginning, middle and end. Good story telling is what a good journalist does. The problem is that this leads to de-contextualisation, with studies looked at in isolation and generating the impression that each of them is a single morsel of the ‘truth’. This is why we feel flabbergasted when yesterday’s Guardian tells us coffee causes cancer and today’s CNN report says is cures cancer. In reality, research studies form continuous lines of evidence that must be interpreted together, approaching something closer to the truth. Let us examine the specific case of cannabis usage reported here. While this report may lead you to think that THC will destroy your brain, there is evidence that cannabis use is not nearly as harmful as heavy consumption of other psychoactive substances such as alcohol. Of course, cannabis use remains an unsafe recreational activity, solidly linked to cardiovascular, respiratory and mental disorders (here, here and here). It’s all a matter of relative risk. How we read a scientific paper and a newspaper article are two different things. We cannot expect our audience to know the full background to the story, or the current consensus on a given topic. But it can guide us towards learning more – a simple statement of caveats leads many readers thinking “well hang on, why?”. Science journalism can be a powerful window into the vastness of science, and encourage people to explore, learn and wonder. So let us encourage this, show how exciting a finding or theory is, and leave the door open. If enough people are left in suspense, wondering why, they will go and find out – and that is a good thing. Press release from Northwestern University and original paper published in the journal Schizophrenia Bulletin. Science is a collaborative kind of thing. People find things out, write it and disseminate it to tell your colleagues and the world at large what you’ve done – and read up what everyone else is doing too, to guide your way. Most people are familiar with the concept of a scientific journal – the practising scientist makes an observation, writes a report and publishes it in a funny-looking journal. The problem, at least according to Randy Schekman, is that the race to the top, to be published in the most prestigious journals, distorts the scientific process and favours eye-catching research over solid research. In an article for the Guardian, Schekman, Nobel laureate and Professor of Cell Biology at University of California Berkeley, says he will be boycotting top-ranked scientific journals, such as Nature and Science, presumably favouring less prestigious but more balanced publications. This highlights a looming problem the scientific community currently faces: publication in such journals is highly desirable but often provide an inaccurate representation of the field. Top journals commonly favour either dazzling results or controversial ideas, picking a very select subsection of all scientific material published, biased towards the headline grabbing. As such, scientists are encouraged to work on fashionable or contentious topics, often disfavouring fields that are not seen as ‘up and coming’. I would like to argue the problem is not the race to the top – it’s hiring the best climbers. While there is a selection bias towards exciting and cutting edge research, that is human nature – we are attracted to it and scientists have the freedom to choose what topics to study. The intrinsic idea of a ranking for scientific journals is also not surprising; it is useful to know if an article is a deal breaker, or more of a run of the mill finding, based on where it appears in the literature. What gets to the core of the issue is publication bias being sustained by the academic assessment system. Publication in prestigious journals is seen as necessary for success in academia – the more of these you accumulate, the better your chances of landing a job or securing a grant. For institutions, it forms the core of their assessment, with laboratories, departments and universities ranked based on their ability to continuously produce high impact publications and directly affecting their ability to secure essential funding to continue operating. So while Prof Schekman has made a valuable stance to highlight the deficits in the current system, it does little to propel change. Change would come from the places where value is given to such things, at the meeting rooms of grant-awarding bodies, populated by the likes of Prof Schekman. Indeed, he would be better of saying “I will judge applicants based on the quality of their work and not the impact factor of their citation list” rather than “I won’t publish in Science”. Science has always been about understanding the world around us, so let us reward those who help us see the vistas, and not those who race to the summit. Original article published in The Guardian, as well as more journalistic coverage here and here. For more information on academic rankings, see Wikipedia articles on Impact Factor and H-index. The big news of the day is, of course, the United States government shutdown. In short, due to a lack of political consensus, many government-funded activities are grinding to a halt, science included. This is no small matter – the US National Science Foundation is sending 98% of its employees home while the National Institute of Health has introduced a halt in clinical trials. We are witnessing an unprecedented hit on state-funded science for the nation that produces the most scientific publications by a long shot. Science, particularly big science (think CERN) depends heavily on government money. Without large federal grants many important achievements would not have happened, from the human genome project to the international space station. So while science is dependent on government, and most of academia has come to accept that, it seems absurd it should be held ransom to the political process in Washington. So what does this mean? On practical terms, quite a lot; projects being frozen or stopped altogether, funding cycles delayed for months to years and the general machinery of scientific research taking a large blow to its capacity to operate for an undefined amount of time, as of now. But beyond the day-to-day practicalities, this sets a precedent for the relationship between government and state-sponsored science. It sets science as a low-priority activity amongst the jobs that must be safeguarded in the event of fiscal debacle, and that is not a good thing. Here are two reasons; first, medical research. Clinical trials typically take years, if not decades to carry out – undermining these either directly by understaffing or indirectly through insufficient funding, potentially delays life-saving treatment being available to those in need. Second, and perhaps more nuanced, is the disruption in basic research. One of the strongest arguments for funding basic research is that you never know what may turn up further down the line. Abstractions in theoretical physics lead to atomic energy. Radio was invented because a James Clerk Maxwell and came up with a theory of how electricity works. Practical applications often come from non-practical research and restricting the latter would certainly damage our chances of finding new solutions to current problems. This has real economic implications – non fossil-fuel cars? Stopping climate change? It is from the improbable hands of basic research that real solutions to these problems will come, changing the economic landscape. So while the politicians bicker up in Capitol Hill, spare a thought for federally funded science. Scientific progress is shackled by the makings and undoings of government budget, and will continue to be so for the foreseeable future. This is poor policy for any country that takes investment in its future seriously. News on the effects of the US government shutdown on publicly funded science has been published by Nature News, Science Magazine, PBS and the AAAS, among others.